Phende Norbu Rinpoche (b.? - d.?) 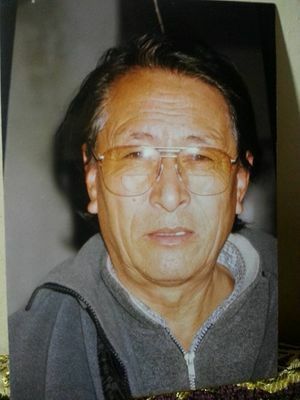 was a son of Dudjom Rinpoche and Sangyum Kusho Tseten Yudron, and a younger brother of Thinley Norbu Rinpoche. Though he was a Tulku and a son of Dudjom Rinpoche, he was a very discrete simple man, and maintained very low profile. He settled in Nepal. Phende Norbu Rinpoche (‘Jewel of Beneficial Well-Being’) [was] very generous, kind, humble, and unconcerned about doing anything himself for this ordinary life, which is actually of no concern, but causes those who love him to worry. ↑ Private conversation with Lama Yeshi Phuntsok, Paris, France, 2017). ↑ Thinley Norbu Rinpoche (A Brief Fantasy History of an Himalayan, Shambala, 2014, page 12. This page was last edited on 18 December 2017, at 23:01.